To celebrate the release of Narcos season 3 the YouTuber, who has taken on everything from political debate to the NFL, Game of Thrones as a theme park, and Yoda's hatred of seagulls, takes various scenes from the various Narcos episodes, seasons 1 and 2, and creates an alternate, vastly more absurd epic storyline. The hilarious fake extended trailer (above) for the third season of Narcos sees DEA agents Steve Murphy and Javier Pena recruit a cocaine kingpin Pablo Escobar doppelganger, called Ryman Branson (complete with some cute porpoise tattoos), to infiltrate the drug lord's home and help them bring him down. But not all goes quite according to plan and what we get instead is nothing like the Narcos episodes you're used to. Family man Pablo Escobar kisses his wife in "SOY PABLO" - Image: YouTube / Bad Lip Reading / Netflix. 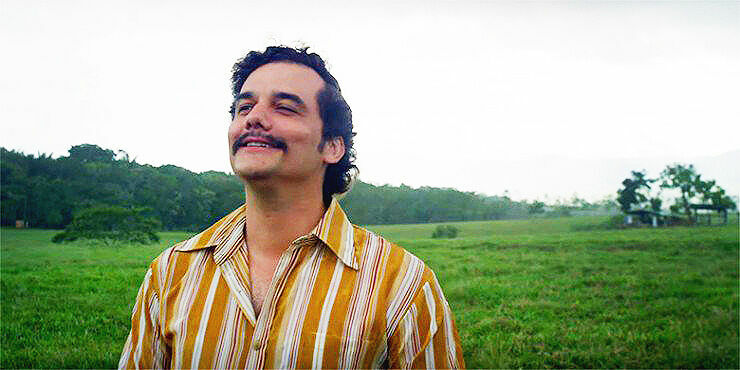 So no longer is Wagner Moura's Escobar a ruthless narco-terrorist and cocaine kingpin, but rather a devoted, rather soppy family man who likes to make fart sounds when he kisses his wife, Tata. Or who likes to get stoned and laugh with his buddy about women with tiny fingers. Or undertake surrealist photography with rubber spiders. "SOY PABLO" (i'm Pablo) he says at every opportunity, just to remind everyone exactly who he is. The "SOY PABLO" video couldn't be further from the menacing, violent underworld that you're used to from the Narcos episodes. Instead we get a kind of goofy comedy with some heartfelt moments and some truly absurd lines of dialogue, like "Your eyes look like porpoise spirits." In fact porpoises feature quite a lot in it. It's certainly an unusual narrative, for sure. A little off brand too you might say, but it's a lot of fun. Maybe a type of comedic tone that could be explored in Narcos season 4? Or maybe not. Check out more from Bad Lip Reading at their YouTube page. Pablo Escobar, the happy drug lord - Image: YouTube / Bad Lip Reading / Netflix. Narcos At The Emmys - Will The Pablo Escobar Netflix Show Win Big For Season 2?